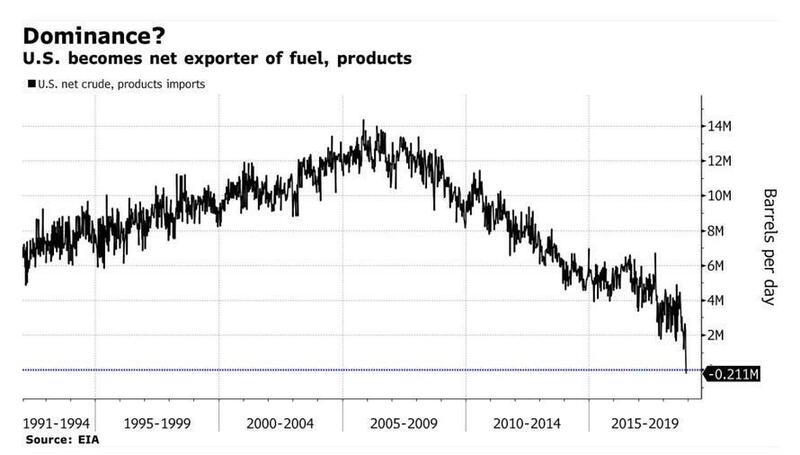 As we previewed last month using estimates from Bank of America, today the Energy Information Administration (EIA) officially confirmed that the United States became a net exporter of crude and refined products for the first time last week. This marks a departure from American dependence on foreign oil which the U.S. has relied upon for more than 75 years. According to U.S. data, crude shipments reached a record 3.2 million barrels last week with net exports turning just positive. As a result of the boom in shale production, OPEC has seen its influence decline, putting to bed its decades-long reign as one of the globe's massive geopolitical forces, and a key factor behind the petrodollar. The news comes just as OPEC is meeting in Vienna to agree on potential output cuts in order to support the price of oil. Michael Lynch, president of Strategic Energy & Economic Research, told Bloomberg that the US is "becoming the dominant energy power in the world. But, because the change is gradual over time, I don’t think it’s going to cause a huge revolution, but you do have to think that OPEC is going to have to take that into account when they think about cutting." 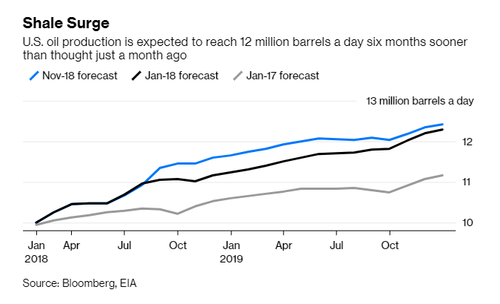 Last week the U.S. sold 211,000 barrels a day of crude and refined products, compared to net imports of more than 2 million barrels per day on average so far this year. This number peaked at more than 12 million barrels back in 2005. Oil analyst Joe McMonigle told Bloomberg: "Trump is making America great again. First president in modern time to get America to be energy independent, if only for one week." We previewed this critical inflection point last month when discussing America's imminent energy independence. 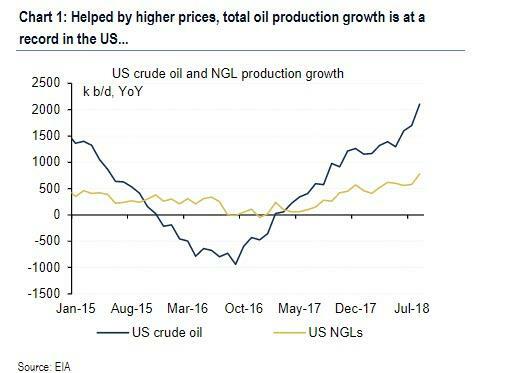 We noted then that, helped by higher prices, total oil production had hit a record level in the US, reaching a combined 15.9 million b/d (crude oil and NGLs) in the past month and almost 2mn b/d above last year. This number was broken down into 11.35mn b/d of crude oil and 4.57 mn b/d of natural gas liquids (NGLs). As a reference, the US will likely consume about 20.7mn b/d of oil and other liquid fuels in 2018. 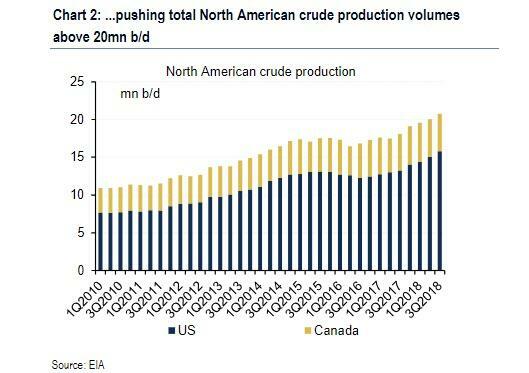 The surge in US and also Canadian output has pushed total North American crude production volumes above 20 mn b/d. 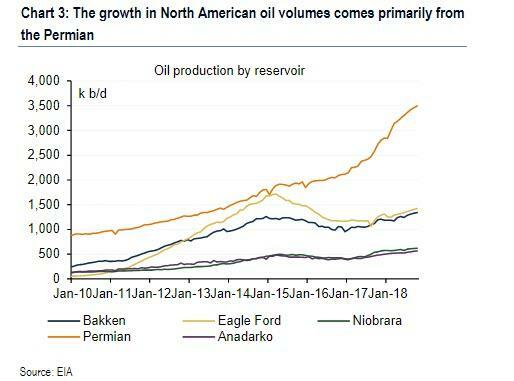 The larger-than-expected surge in North American oil volumes has come primarily from the Permian, Canada's oil sands, and more recently, the Gulf of Mexico. 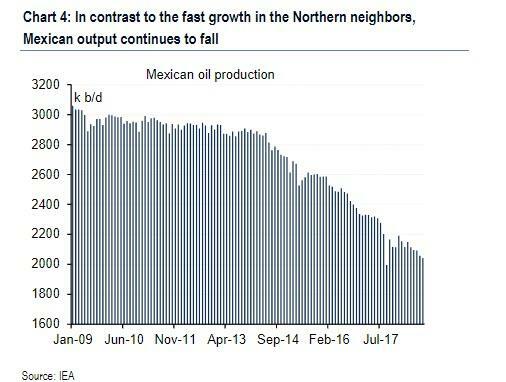 In contrast to the fast growth experienced by its Northern neighbors, Mexican oil output continues to fall as the effects of the latest energy sector reform have yet to be translated into output. We had also mentioned that the additional pipelines being built in the Texas Permian Basin were likely going to help solve a bottleneck of crude transportation that could put the United States in the position that it’s now in. From there, we noted that the bottleneck would likely move to the ports of Texas as oil would eventually go from "production hell" to "delivery hell" to "logistics hell". Like in 2014, the biggest threat to Saudi Arabia remains the Texas oil patch. Producers in America have added significant volume over the last 12 months. 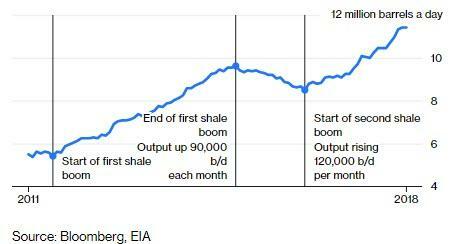 In fact, just the added output this year is equivalent to the entire output of OPEC‘s Nigeria. Undoubtedly the Saudis are acutely aware that the United States is gaining traction on becoming energy independent, especially specific to crude. As MBS continues to further his juggling act between the oil market, OPEC and world leaders, it looks as though the price of crude - as well as the Saudi government - may remain volatile for the new year to come.